This session will explore the various components of any learning program that are needed for successful language learning to take place. Reading is probably the most important skill that we can give our learners. Unfortunately, many of our learners are still unable to read confidently and smoothly by the time they leave our high schools. This session will present an approach to reading that encourages students to read fluently and for enjoyment at the very earliest levels of language ability. This will include the use of graded readers and other student-centred reading materials. Dr. Rob Waring is Associate Professor at Notre Dame Seishin University in Okayama, Japan. He is an acknowledged expert in Extensive Reading and second language vocabulary acquisition. He has published over 40 articles and has lectured in 15 countries on foreign and second language acquisition. He has just published a set of graded readers for teenagers. He is a board member of the Extensive Reading Foundation. 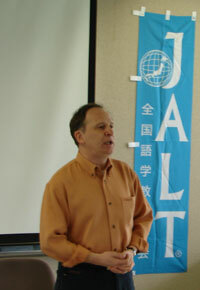 Rob was Co-Chair of JALT 2005.